Baby On Board: What Does Texas Law Say About Keeping Our Kids Safe in the Car? We’ve all seen those yellow “Baby on Board” signs proudly displayed by new parents on the back windows of cars. In a perfect world, drivers would slow down and car accidents involving children would never be an issue. But we don’t live in a perfect world. The Insurance Institute for Highway Safety (“IIHS”) reports that car accidents cause one in four unintentional injury deaths in children younger than 13. The IIHS explains that while most crash deaths occur among children traveling as passengers, proper restraint use dramatically reduces these fatalities. Such statistics are a sobering reminder that we must do all we can do to ensure that our kids are safe while traveling in a car. So what can Texas families do to make our daily commutes safer for our children? 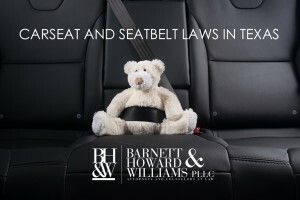 What does Texas law say about keeping our kids safe in the car? Follow manufacturer instructions – It is a violation to use a safety seat improperly. One of the important parts of the Texas car seat law is that seat must be properly installed according to the manufacturer’s instructions. USA Today reports that nearly half of all car seats are installed improperly. Many law enforcement agencies are trained to understand proper car seat installation. While it is unlikely that an officer will issue you a citation if you have a car seat that happens to be improperly installed, you should still make sure to get your car seat checked out for the safety of your child. DEFENSE: It is a defense to prosecution that the individual is operating their vehicle during an emergency or for a law enforcement purpose. PENALTY: Failure to comply with §545.412(a) may result in a fine ranging from $25 to $250, plus court fees. All infants and toddlers should ride in a rear-facing car seat until they are at least two years old, or until they max out the weight or height limits per the manufacturer’s limits. Children two to four years old may ride in a forward-facing seat according to the manufacturer’s recommendations. Use a booster seat for children four to eight years old, according to the maximum height or weight limits provided by the manufacturer. Most seat belts will fit a child that is 4’9″ tall (normally around 10 years old). If your child is not 4’9″ tall, you should consider keeping them in a booster seat to ensure proper seatbelt fit. Can a Teenager Ride in the Bed of a Pickup Truck? No. Under Texas law, no person under 18 years of age may ride unrestrained in the bed of a pickup truck. PENALTY: A violation of the seat belt law in Texas can result in a fine of $25 to $200 depending on the situation. For teenagers, who are legally permitted to ride in the front passenger seat, the Texas Department of Transportation advises that wearing a seat belt while sitting in the front seat improves survival of a car accident by 50%. To be effective seat belts must be used properly—lap belts need to fit snugly on the hips and shoulder belts should go over the shoulder and across the center of the chest. Texas law says that safety belts—designed for adult use only—are not adequate for children under 8. There is not a law in Texas regarding who may ride in the front seat. The driver must follow the car seat and seat belt laws, but there is not a law prohibiting any person or child from riding in the front seat. However, according to the safety “guidelines,” anyone under age thirteen should be restrained in the back seat due to concerns with airbag impact. Can I Leave My Kids Alone In the Car in Texas? An offense under this section is a Class C misdemeanor. However, if the child is injured as a result of being left in the car, the crime can be increased to a felony, punishable by up to two years in jail and a $10,000 fine.